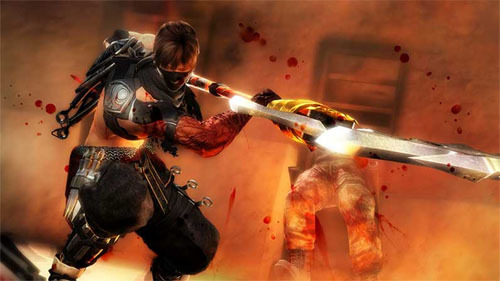 Which side of the razor's edge does the latest Ninja Gaiden release fall on? Ninja Gaiden 3: Razor’s Edge (henceforth Razor’s Edge) was originally an enhanced Wii U port of the original Ninja Gaiden 3, complete with all the DLC and additional enhancements. The Razor’s Edge that came out last week (and the version this review is about) was the port of that game to the PS3 and 360. So I guess it’s a port of an enhanced port of the original game. Confusing, but there we have it. There are three main categories of gameplay offered for Razor’s Edge: Story mode (single-player), Chapter Challenge (single-player, unlocked later), and Shadows of the World (online multiplayer and co-op, co-op unlocked later). All of these modes share the same gameplay mechanics, so let’s talk about those first. Combat is probably what one would expect from a Ninja Gaiden game. Mobility and blocking are key, and there are long and complicated combos of strong and weak attacks players can string together for some pretty cool effects. There are multiple weapon types that players can switch between (e.g. claw vs. katana) and multiple ninpos (powerful abilities that need to be charged up). Levels consist of different stages where all the enemies need to be vanquished, and then the player will receive a time and health grade, which converts into a “karma” point system. These points can be spent on new techniques, costumes, rank-ups, etc. Though this all sounds pretty neat on paper, in practice I wasn’t too blown away by the combat. I’d consider myself a fan of third-person action games and I’ve been impressed by the Ninja Gaiden games I’ve played in the past. Razor’s Edge just didn’t grab me like those other games, and a lot of that had to do with the combat. Finishing off an enemy with a strong attack causes the camera to zoom in for a close up of the gory death, which sounds fine; however, since I often found myself finishing off several enemies in a row, I was treated to a repeated zooming in and out of the camera. This got old really fast. Quick time events are also quite prevalent, especially during boss fights. The quick time events weren’t integrated in an innovative way and felt a little tacked on. Last, though Razor’s Edge allows players to play as four different characters, none of the characters really felt different enough for me to feel very excited about getting to play a new one. They had different animations for sure, and I’m sure there are nuances to their combos which make them different from each other, but as a casual player it didn’t feel like enough to make unlocking them an exciting experience.